Trouble always comes in threes. At least that’s what Lucky O’Toole, the VP of Customer Relations for Las Vegas’ primo Strip casino/hotel, the Babylon, has heard for years from her mother. So, tonight, when Teddie, her former lover shows up at her office unannounced and very unexpected, her father offers Teddie a job at the Babylon, she is called to deal with a pig in residence at one of the hotels most exclusive and opulent suites, and Lucky’s current lover, Jean-Charles Bouclet stops answering his phone leaving Lucky to handle his five-year-old son, Lucky figures she has tonight’s compliment of chaos covered. As usual, she is a tad optimistic. With a cadre of celebrity chefs with the maturity of teenagers in Vegas for a televised cook-off, a prized Alba truffle in the Babylon’s care, and her mother’s pregnancy racing toward the inevitable, what could go wrong? When the truffle is stolen from the walk-in in Jean-Charles’ gourmet burger joint at the Babylon and a young chef apparently killed with a smoking gun is found in Jean-Charles’ food truck on the back lot, trouble takes a sinister turn. And Jean-Charles still isn’t answering his phone. Another body is discovered. This one stuffed in an oven at Jean-Charles’ eponymous restaurant and set to broil.Desperate to put a lid on the body count and more than frantic over her AWOL lover, Lucky uses her Vegas contacts to search in places and in ways the police wouldn’t or couldn’t. Teddie insists on riding shotgun. Lucky hasn’t the time nor the resolve to say no. She’s never been able to resist Teddie … not really. 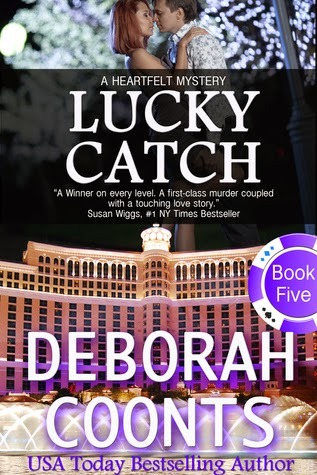 With danger dogging their heels, Lucky finds herself falling once again under his spell as they traverse Vegas, being drawn deeper and deeper into the highly competitive world of high-end eateries and the battle for the very rare, most highly prized gourmet foodstuffs.Would somebody really kill for a truffle?In a heartbeat. And when Lucky’s path crosses the killer’s… will her goose be cooked? You know those books you read that you are almost ashamed to admit you secretly love? The ones that feel like a guilty pleasure? The Lucky O'Toole books are like that for me so I was pretty excited about reading Lucky Catch, the latest in this series. Set in Las Vegas, as usual, our unwitting heroine never fails to get into all kinds of messy situations whether it be through work or her romantic life. Full of innuendo and catch phrases, I zipped through reading this book and then almost felt like I should be looking over my shoulder to see who had seen me! The characters are so enjoyable and almost somewhat caricatures of themselves. The story flows extremely well from one crazy event to the next which is one of the reasons that I truly love these books. Almost completely unbelievable, but it will have you hooked from the first page! Lucky sort of reminds me of a femme fatale from a Film Noir with a mix of characters from the Rat Pack as her sidekicks. Truly a great and thrilling ride! Thank you to Cool Gus Publishing for our review copy. All opinions are our own.